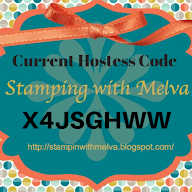 Stamp with Melva: Paper Pumpkin - You need to check it out! If you haven't checked out Paper Pumpkin yet, you need to! 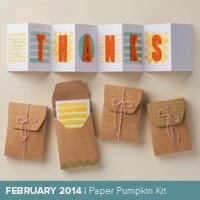 Paper Pumpkin is a kit that comes to your door every month that includes all of the stamps, ink, paper and accessories to make amazing projects. Sometimes it's cards and sometimes it's 3D projects - it's always a surprise! 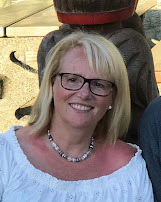 The projects take approximately 30 minutes to make - I love spending the time making a new project - especially one that someone else has designed and gathered all of the supplies I need to put it together. 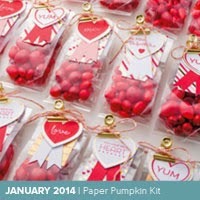 There are a couple of ways to sign up for Paper Pumpkin - as a monthly subscriber or in a Pre-paid subscription. The cost is $24.95 per month with some savings if you purchase a pre-paid subscription. During Sale-a-Bration, it's even easier as you can sign up for a 3 month pre-paid subscription for $68.85 Cdn PLUS you earn 1 free Sale-a-Bration reward. What could be better! Remember this promotion is only available until March 31st. After that the pre-paid subscriptions go back to regular price. Here's some samples from the kits from January and February. I can't wait to receive my March Kit! These kits were such fun to make. There are always very creative ideas on Pinterest for other ways to use the kits. Interested in learning more or subscribing? Email me or you can click here to subscribe. You can order your pre-paid subscription on a regular order - it makes a great gift! Or get your friends to subscribe and then get together to make the kits! How fun would that be!